The key to keeping your weight stable and to avoid packing on the extra pounds is never skip breakfast! I know that everyone's excuse to not eat breakfast is not enough time, but you must make the special extra effort to wake up early and nourish your body with something after that 7-8 hour night fast. 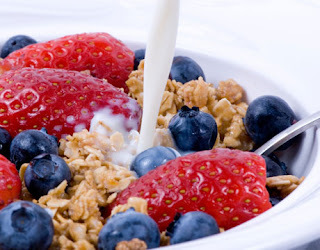 If you skip breakfast you are just setting yourself up for binging the rest of the day. We must feed out bodies after sleeping 7-8 hours and it is important for your metabolism as well. Just like a car your body needs fuel to run on. Think of having breakfast as refueling that empty gas tank. You cannot drive on an empty gas tank and your body cannot function on an empty stomach!!! Your breakfast does not have to be something that will take you 30 minutes to make. It can be something simple as an apple with some string cheese. You have your fiber from the apple and the protein from the cheese that can sustain your for about 2 hours. Another great thing that does not take long is a whole wheat waffle with one tsp of peanut butter. You have the protein from the peanut butter and then the carbohydrate (good carb since its whole wheat) from the waffle. I notice if I do not eat breakfast I tend to get headaches or I just feel run down all day. By skipping breakfast I have decreased my metabolism. I feel lazy, tired, groggy, and extremely hungry throughout the day. So remember to fuel up your body in the morning so you can keep on going throughout the day. This is an example of what I eat. But not daily because variation is very important. If you are redundant you get bored and then tend to fall of the wagon. It is just important to remember to eat every 2-4 hours and hydration is very important. If you multiply your body weight by .66 that is how much water in ounces you should be drinking daily!!!! Still in shape 3 years after having my second child! It has been almost 3 years since my second child! I am still at my pre-pregnancy weight! This Mad Diet really works! I think everyone should adapt it as their lifestyle. I have actually stuck with this diet basically after all my pregnancies and it has helped me keep the weight off. Having a healthy diet and incorporating exercise into your life can be beneficial not only for you, but for your whole family! Being fit gives you more energy for your kids and you can be a better mom. Exercise will keep you energized throughout the day to keep up with your kids. Also, it is a great stress reliever. I look forward to my workouts everyday where I have an hour to myself to not think about anything going on in my life except for burning some extra calories and getting into good shape. The key to keeping in shape is not only working out, but being active throughout the day. KEEP MOVING!!! If you workout in the morning and keep moving throughout the day you are continuing to burn calories. Always, remember to fuel up as well on healthy snacks. It is very important to eat 3 meals a day and snack in between. Remember to replenish your body with nutrients every 2-4 hours. This will prevent drops in your blood sugar leading to binging at your next meal due to extreme hunger. These are just some examples of healthy snacks. I will have additional posts with more pointers on losing weight and keeping it off!!!! It has been a while since my last post!!! I am in the process of doing my Masters in Nutrition and classes have been pretty tough. However, I am learning a lot and will be posting more information on nutrition and fitness very soon.